I have not one but THREE upcoming appearances to announce, yay! Tickets are just £5 and can be bought here. 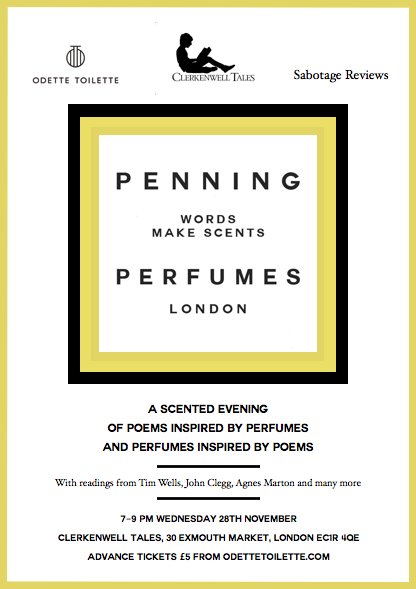 AAAAAAAND, to make things a whole lot less London-centric, Penning Perfumes is going on tour in the new year – to Oxford, Birmingham, Manchester and Bristol. There will be a mix of poets from the original project and new voices in each city – here’s the full schedule and line-up. I’ll be reading in Bristol on February 27th. I’ll also be reading at Pigeon Poetry: The Winter Gents on December 15th, at the Poetry Café in London. This is a lovely, intimate night run by the cross-genre TREMers Theatre Company – I read at their first poetry night back in June and it was very special, and I can’t think of anything better to do on a cold winter’s night that cosy up in a warmly lit basement and share words.